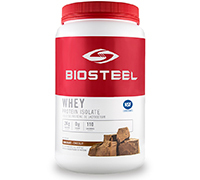 The BioSteel Whey Protein Isolate is the highest quality protein powder available. The BioSteel WPI is packed with 23g of protein per serving, has zero carbohydrates and is naturally sweetened with stevia. BioSteel WPI is a great post workout protein supplement and may be well-suited for those who are following a low calorie or low carbohydrate diet. The BioSteel WPI promotes lean muscle growth and fuels your muscles with the highest grade of protein commercially available. The WPI is the most undenatured form of whey protein available, its native protein structures are kept intact through a specialized production format. BioSteel WPI has the highest protein content and biological value of any protein supplement on the market. The BioSteel WPI is lactose, fat and cholesterol free and has the lowest level of potential allergens of any comparable protein product on the market. BioSteel's Recovery Complex provides a potent dose of key amino acids that the body craves after periods of exercise. BioSteel's proprietary blend of the highest quality amino acids are designed to repair muscle damage, enhance lean muscle gain, improve immune function and reduce the effects of exercise induced stress. The ingredients in the Bio-Gest system have been shown to aid the metabolism, have strong anti-oxidant and anti-inflammatory effects, and increase the absorption and utilization of key nutrients critical to the muscular recovery process. Every production lot of BioSteel's WPI undergoes comprehensive testing from an accredited lab and prestigious banned substance screening program with WADA and Anti-Doping experience. Several hundred Professional and Olympic athletes using BioSteel's WPI have undergone hundreds of random drug tests, all without incident. Whey Protein Isolate 26 g, L-Leucine 3 g, L-Glutamine 2 g, Phosphatidylserine 50 mg, Betaine (Betaine Hydrochloride) 50 mg, Organic Ginger Extract (Rhizome) 25 mg, Enzyme Blend (Cellulase 20 mg, Alpha-Amylase 20 mg, Protease 20 mg, Lopase 20 mg, Lactase 20 mg). Strawberry: Natural strawberry flavour, beetroot red, freeze dried strawberries, stevia rebaudiana leaf, xanthan gum. Vanilla: Natural vanilla extract, stevia rebaudiana leaf, xanthan gum. Chocolate: Natural chocolate flavour, cocoa powder, stevia rebaudiana leaf, xanthan gum. Mix 1 scoop in 250 ml -1000 ml of cold water or beverage of your choice. Vary the amount of liquid to achieve your own desired taste and consistency.